Floods have hit several states in the country this year causing massive damage to life and property. The ordeal started as back as April and has continued till now. What was the scale of devastation? What were the steps taken by the government to tackle the situation? Here is a status report of the flood situation in India. minister at Parliament House this morning and apprised him of the situation arising out of the heavy rains and flood in parts of the state. 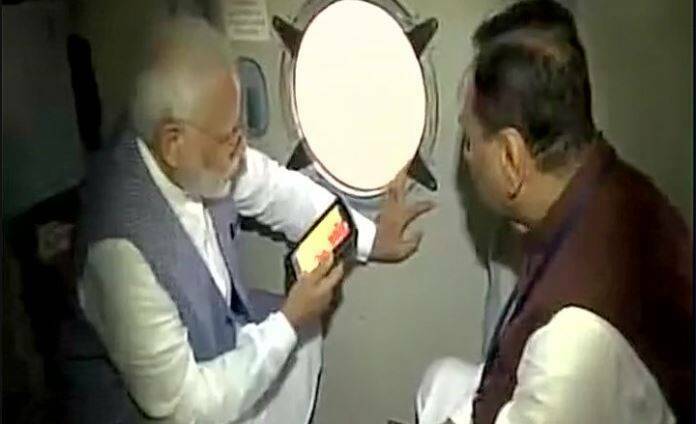 Gujarat floods: Prime Minister Narendra Modi conducted an aerial survey of flood-affected Banaskantha and Patan districts in north Gujarat where thousands of people are marooned due to incessant rains. Meanwhile, aside from Gujarat, Rajasthan, Jharkhand, Odisha and Northeastern states of Assam, Nagaland and Manipur have also been affected by floods. The ordeal started as back as April and has continued till now. What was the scale of devastation? What were the steps taken by the government to tackle the situation? Gujarat: Gujarat has also been one of the worst hit states in the country. Prime Minister Narendra Modi visited his home state soon after calling upon newly sworn in President Ram Nath Kovind. Gujarat is facing one of the worst floods in its recent history. Even on Monday, around 25,000 people were shifted to safe locations by evacuation teams. Indian Air Force is conducting evacuation operations and also dropping food packets to people stranded in flood hit areas. Indian Air Force rescued 113 people from flood-hit regions on Tuesday and dropped food packets in Shihori and Jhabadiya villages of Banaskantha. The Army, Border Security Force and NDRF are assisting the Air Force in evac operations. The worst affected regions currently are Dhanera, Deesa and Tharad towns. Dhanera saw 235 mm rainfall in a matter of just six hours. Dantiwada, Sukhbhadar and Sipu dams were opened after massive massive inflow of water. After the water was released, the adjoining regions, including some villages, were inundated. In addition to the 14 NDRF teams operating in the region, additional teams have been called from Pune. Traffic was affected on one national highway and 20 state highways as well making travel extremely difficult. The situation is grim in Rajasthan as well. Three districts in the state are critically hit by heavy rains and flooding. The inflow of water is also causing issues in Gujarat ‘s Dharoj dam and its nearby areas. Around two lakh cusecs of water was released recently from Dantiwada dam due to the influx of water from Rajasthan. Villages in Rajasthan are also on alert. Sixteen villages in Matar and 18 in Kheda have been put on flood alert. As many as 25 villages in Mehsana are also on flood alert due to release of water from Dharoi dam in the Sabarmati river. April 2017, Jammu and Kashmir: Flooding was reported in the Jammu and Kashmir after heavy rains lashed the Kashmir valley. The water levels in the river Jhelum and its tributaries Veishov, Rambiara and Lidder rose quickly and caught the locals off guard. The river passed the danger mark on April 6 near Rammunshibagh which is near state’s capital Srinagar. Low lying areas were affected by the flood and rescue operations were carried out by the National Disaster Rescue Force and the Army. No flood-related deaths were reported in the region. In Kupwara district, flash floods were accompanied by avalanches and even lightning strikes. One girl was reported killed due to the flash flood. A massive amount of fruit crop loss took place and schools had to be kept close. Now the situation in the valley is normal. Northeast India under floods: According to the July 24 report of the Assam State Disaster Management Authority (ASDMA), the death toll in the northeastern state stood at 76. Severe flooding has affected the state since April this year. The report suggests flood waters were receding in critical areas and the the situation had improved in the past few days. It said that many people had started returning to their homes as well from relief camps. The people currently affected by floods have decreased from 95,000 on July 22 to 60,000 on July 24. In a report of 11 July, ASDMA said that approximately 1.5 million people in 2,498 villages of 23 districts had been affected. Districts still under impact of floods include Lakhimpur, Biswanath, Barpeta, Morigaon, Nagaon, Golaghat, Jorhat, Sivasagar and Karimganj. The states of Meghalaya, Tripura Arunachal Pradesh have also been affected with flash floods in past months. In April, IMD recorded ‘extreme rainfall’ in the three states. In some areas the rainfall was as much as 162 mm in 24 hours. Arunachal Pradesh and Nagaland were also affected and saw massive landslides. State governments had announced ex-gratia and restoration sanctions for the damaged roads as well. The Assam region was hit with its first ‘flood wave’, as it is called by climate scientists, this year on June 4 and continued till June 18. The second wave hit Assam in the last week of the same month and the third in July. The overflowing rivers and heavy rains caused land erosion and hence the villages were affected even worse. A total 200 hectare of crop area was destroyed. Odisha: Odisha was hit with a flash flood in mid July. The floods occurred in Rayagada and Kalahandi districts. Rains caused overflow in two rivers in the state. Two people were reported killed in due to the flood as well. Five bridges were also damaged due to the floods which some villages in the affected districts were completely cut off. The Central Water Commission says that the levels are normal now. Though the threat of flooding still looms large as the Monsoon season is still on. As of now, six districts are on flood alert after the Met department predicted heavy rainfall.